All new FLEXIDOME IP starlight 8000i; simplier by working smarter. But it takes a smart camera to simplify the video security process, as demonstrated by the remote commissioning functionality. By using a smart device, together with the Project Assistant app, the pan, tilt, roll and zoom (PTRZ) function can set the required field of view without having to touch the camera or lens. 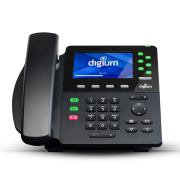 This remote commissioning and configuration can be adapted at any stage beyond the initial set-up, making it quick and convenient to adjust the field of view should initial planning requirements change, e.g. new layouts. For such future-facing cameras, the new FLEXIDOME IP starlight 8000i range is surprisingly resistant when faced with the elements. With an IP66 water resistance, IK10+ vandal resistance, anti-corrosion coating and operating temperature range of -50 to +60°C, they’re at home in challenging indoor and outdoor situations. This robustness is beneficial to business, as is the level of detail captured by the cameras. Higher resolutions and frame rates, better light sensitivity and excellent dynamic ranges all help to distinguish individuals or objects for irrefutable evidence. The combination of these advanced features together with starlight technology in HD 1080p, 6 megapixel, or the 4K Ultra HD resolutions provides exceptional detail even in extreme low-light situations. A hidden asset featured as standard on all FLEXIDOME IP starlight 8000i cameras is the built-in industry-leading Intelligent Video Analytics. When combined with the aforementioned outstanding image resolution, it further increases the accuracy of the security solution by intelligently distinguishing between genuine security events and known false triggers caused by challenging environments such as snow, wind, rain, hail and water reflections. This brings the added benefit of users only being alerted when it’s absolutely necessary. It’s ideal for high-security applications and provides automatic object detection over large distances such as perimeter protection of airports, critical infrastructures, government buildings, border patrol, ship tracking and traffic monitoring (e.g. wrong-way detection, traffic counts, monitoring roadsides for parked cars). Built-in Intelligent Video Analytics provides more benefits than simply keeping watch for intruders. By interpreting in detail the video data captured by these cameras, it elevates their importance far beyond security. For example, interpreting video data helps to monitor consumer patterns, like identifying ‘hot spots’ in an airport’s shopping area; information that can be used to increase sales or improve the experience of travelers by identifying possible bottlenecks in foot traffic. However, detailed analysis relies on detailed imagery. With FLEXIDOME IP starlight 8000i dome cameras, capable of up to 4K Ultra HD, you can capture every detail. What’s more, with frame rates up to 60 fps FLEXIDOME IP starlight 8000i cameras capture fast-moving objects easily, whilst dark and bright spots pose no problems thanks to the High Dynamic Range. The Bosch FLEXIDOME IP starlight 8000i range features Intelligent Dynamic Noise Reduction and intelligent streaming combined with H.265 video compression. This can reduce bitrate by up to 80% to keep video data manageable, whilst substantially reducing network strain and storage costs without compromising video quality. 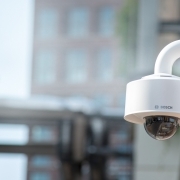 And, like all Bosch network cameras, the range offers various sophisticated software and hardware measures, such as a built-in Trusted Platform Module, to maintain the security of vital video data. A category-changing concept in video security, the new Bosch FLEXIDOME IP starlight 8000i range delivers clear benefits from the outset.